Living Space: 5490 sq. ft. This 22 plus acre property is located right on the paved road that connects Dominical and San Isidro. 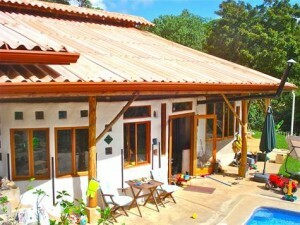 It is less than 10 min from Dominical and the beach and 30 min from San Isidro. The property has several entrances off of the paved road, one at the main house, one at the guest house, and there is also some flat commercial property right on the road. Much of the property is flat or gently sloped and it is very usable for future construction, gardening, fruit trees, etc. There are several creeks that run through the property, several springs, and 2 waterfalls with swimming holes. The main home has 6 bedrooms and 2 bathrooms. It has been built in a very ecological way using earth sacs and clay, a technique that has been used for 1000s of years. The owners are very creative and have done some amazing artistic things with the home that you can see in the pictures. They presently run healing retreats there and that is what it was built for. It has a very calming feel to it and is perfect for a retreat center or BnB. The main kitchen and living area is large and has high ceilings and is the perfect place to gather. There is also a swimming pool. The mountain views are amazing and you can see the famous Diamante Waterfall. The 2 other buildings on the property can be accessed on easy trails from the main house. First you come to the yoga dome which could actually be transferred into a guest cabin easily. It has an outdoor shower and bathroom. Then a little farther down the trail you come to the guest cabin which is made of hardwoods and is very beautiful. It has a full kitchen and bathroom. The same trails take you down through the property and to the waterfalls. The property is full of fruit trees and they also have vegetable gardens. The owners have put a lot of hard work into this property and are sad to let it go. The right person will pick up where they have left off and do wonderful things with this place!!!! !